Dell will launch a “netbook tablet “ and normal netbook, both sporting Android according to a leaked roadmap obtained by Android Central. The Dell Sparta netbook will come with a rotatable 11-inch (1024 x 768) display powered by an ARM processor. It will also come with optional 3G along with Wi-Fi and Bluetooth. The Dell Athens netbook is more typical in its form-factor and will sport a similar sized display and ARM processor. It will have a thin chassis and weigh less than 900g (1.98lbs). These models are expected to launch during the Autumn. Check out a large screencap of this Dell roadmap after the break. 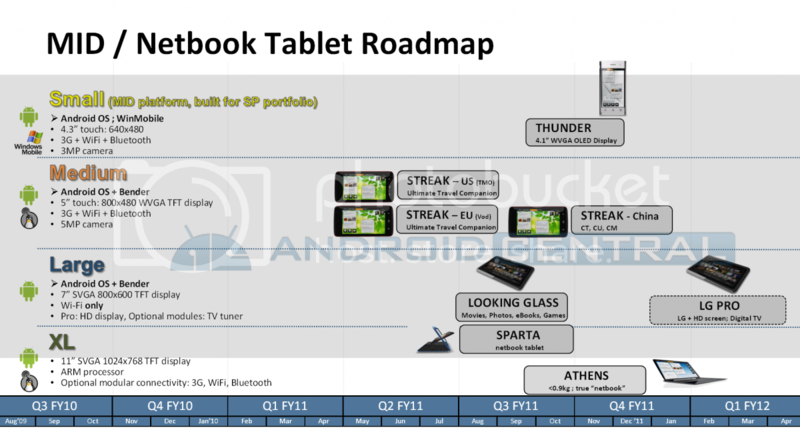 So Sparta’z a smartbook-tablet. Will it have touch interface ? Would like to see a Win7 with all it’s touch UI in the swivel screen form factor. The Dell Mini 5 smartphone from Streak series is something I am really looking forward to. Nokia is just not getting it right for some reason i.e., its way too slow in introducing products either in the netbook segment or in the smartphone one – the netbook ‘3G Booklet’ is perhaps the best but the price killed it before it arrived and a newcomer like Dell is flooding the market with well endowed smartphones straight off to compete with incumbent rulers in the smartphone space. After seeing Dell Mini 3i, I thought Dell was wrong in getting into the smartphone arena, but the range of smartphones being advertised seem extremely promising for Dell, althought the pricing still needs to be outed. I use Dell laptops and am very happy with I got and am thinking of grabbing (or stealing ..lol ) one of the smartphones once they come out. If the Sparta flips around like that I’m sure that it will have a touch interface, otherwise it would be a pretty useless machine once flipped. If they do the software and the price right I think it has potential!